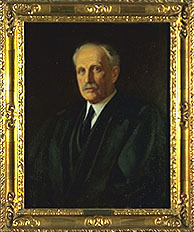 Aaron V. McAlvay was born in Ann Arbor, Michigan, on July 19, 1847. McAlvay’s father was a Michigan farmer, so he spent most of his early life, when not in school, on the farm. His colleague, Flavius Brooke, stated that, “Born without wealth, the early life of Justice McAlvay was characterized by that constant labor and indomitable perseverance which so strongly tends to the upbuilding of character.” He received his primary education in Michigan common schools and finally received a degree of A. B. from the University of Michigan in 1868, a degree of LL. B. in 1869, and the honorary degree of LL. D. in 1910. In 1872, he married Barbara Bassler and had six children, and Michigan was always his home. McAlvay practiced law for 30 years in all the courts of Michigan. He moved his family to Manistee and set up a law practice there in the firm of McAlvay and Grant. He served for several years as Circuit Judge in Michigan, and for the last 10 1/2 years of his life he served as one of the Justices of the Michigan Supreme Court.